Tim Ahlstrom first came to Johns Hopkins in March 1989, at age 50, with the following history. Protein had been noted in his urine during a routine exam 25 years earlier. Four years earlier he had developed heart failure, fever, anemia, and a moderate degree of kidney failure, all of which remained unexplained and receded, except for the kidney failure, which persisted. He was placed on a diet mildly restricted in protein and given drugs to control high blood pressure. He gained 30 to 40 pounds in the next two years, but then decided to do something about his health. He quit his three-pack-a-day smoking habit and, six months before coming to Johns Hopkins, quit alcohol too. He managed to lose 45 pounds. The recurrent headaches for which he had been taking at least 4 aspirin tablets daily for 30 years receded. He started a regular exercise program. 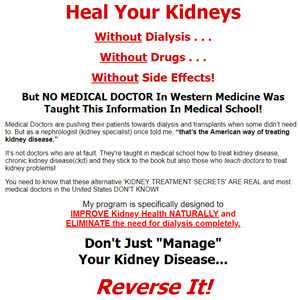 At about this time he saw a kidney specialist, who told him that he should start thinking about dialysis and/or transplantation and that there was nothing he could do to prevent end-stage kidney failure, probably by summer 1989. Tim did some reading in the medical library and made an appointment at Johns Hopkins. protein diet (0.3 g per kg, or 33 g per day), to be supplemented with essential amino acids and later alternately with ketoacids. His blood pressure eventually came down to normal and, after a year, his kidney function actually improved. At about this time he decided to write a book about his experiences with kidney disease, which was published in 1991 (The Kidney Patient's Book). This remarkable book tells how Tim learned of the alternatives available to patients with kidney failure, what the outcomes of dialysis and transplantation are for patients at differing ages, and how to follow a low-protein diet. He published this book himself and, with the aid of his daughter Susan, kept spreading the word, despite having reached the end stage and starting dialysis in April 1992. Tim died a few years later. He had made contact with virtually every prominent nephrologist in the field and with every governmental and nongovernmental agency involved in kidney disease, and had attended and presented papers in the United States and abroad on nutrition and kidney disease. Tim was a prime example of a patient taking charge of his own illness. I urge you to read his book. In the words of Dr. Arnold S. Relman, former editor of the New England Journal of Medicine, it is "an interesting and understandable discussion for kidney patients that does not compromise medical accuracy or objectivity."